(21 minutes) In this episode, Hackie Reitman, M.D. continues his conversation with Dr. Gail Saltz. She is a Clinical Associate Professor of Psychiatry at the New York Presbyterian Hospital Weill-Cornell Medical College, a psychoanalyst with the New York Psychoanalytic Institute, a columnist, bestselling author, podcast host and television commentator and one of the nation’s foremost go-to experts on a variety of psychological and mental health issues. 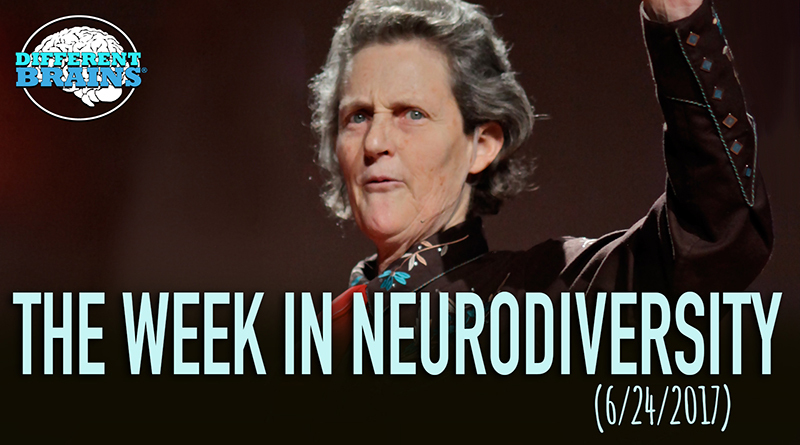 Her newest book is called The Power of Different: The Link Between Disorder and Genius. She also hosts a podcast by the same name. 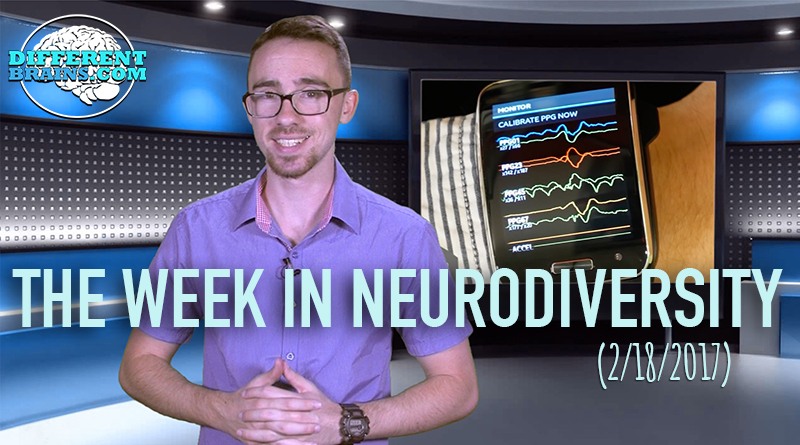 Dr. Saltz discusses the importance of ending the stigma for neurodiverse conditions, the challenges in bringing together opposing viewpoints, and the value in focusing on gifts over deficits. HACKIE REITMAN, M.D. 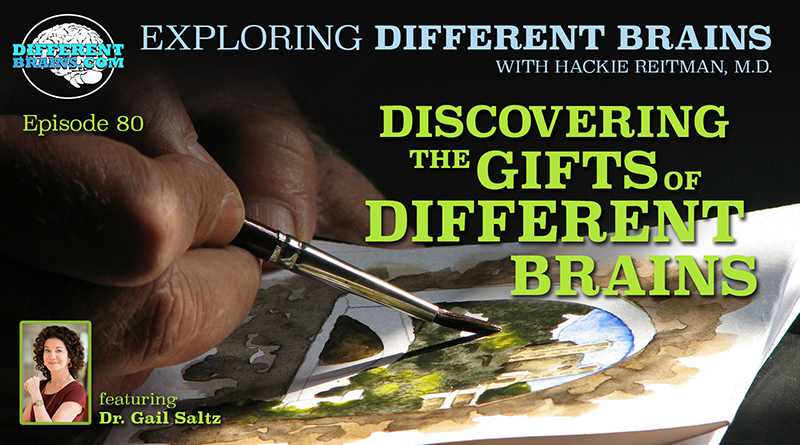 (HR): Hi, I’m Dr. Hackie Reitman, welcome to another episode of Exploring Different Brains. Today, we have the pleasure of re-visiting our friend Dr. Gail Saltz who’s not only a columnist, podcast host, television commentator, and the best selling author whose latest book, The Power of Different: The Link Between Disorder and Genius. She’s also a clinical associate professor of psychiatry at the New York Presbyterian Hospital, Weill Cornell Medical College, and a psychoanalyst at the New York Psychoanalytic Institute. Gail, you’re not busy enough! That’s all I could tell you! GAIL SALTZ, M.D. (GS): Well, I’m very invested i the current project. It’s the culmination of all those things into one. So I’m really pleased to be here with you. HR: Well thanks for joining us again. You’re really one of the pioneering leaders who’s really out there in the mainstream patiently explaining that all of our brains are different, there’s no great stigma to it, and let’s help you harness your strengths, let’s spend 80% of the time on that, and let’s spend in the Dr. Gail Saltz 80-20 rule 20% of the time trying to build up your weaknesses. HR: That was so well put, Gail, I want to put that on the national monument. And I have got to tell you, you have just gave me a lot of inspiration and hope because you have the big picture. And I am sure in your book, “The Power of Different: The Link Between Disorder and Genius”, it goes on to articulate it even further and so well. And what I am finding is the stigma, I agree with you a hundred percent, that’s the big deal. And what I have been very gratified to learn as a little bit of a segway here into our psychology friends, is that my daughter Rebecca who is my hero, who is now her masters in applied psychology, she is taking her favorite course right now which didn’t use to exist in psychology which is biopsychology or the biology of it where they have really gotten into the anatomy and the function. And as you said so eloquently, now that we have this newer and newer where you can see that part of the brain light up. I interviewed Jennifer Jo Brout, and I said, “Jennifer, I have never heard of what you have, Misophonia, which I never heard of.” And she was explaining to me how these body signs like chewing her breathing, they go right to her amygdala, and she can see it light up but she wants to like go into her road rage but she trains herself to go back to her frontal cortex, and maybe go over the reasonableness of it. And so, all of the dots are connecting with all of these things with pioneering leaders such as you. GS: Well, thank you. I hoped that people who are—really can understand this, and part of the reason that I framed the book not only in terms of symptoms and also I spoke with many people, many neural scientist. But many individuals, some of whom people would recognize, like David Sedaris, well-known and highly successful people. As well, somebody they might not happen to recognize because maybe they wouldn’t know the most decorated paleontologist in the nation or a particular Nobel Prize winning doctor. But these are all people who have struggled mightily with some real symptom issues but also use the correlating strength to be highly, highly accomplished which brought in a lot of pleasure in life in addition. So, I hope that not only the data but the understanding of real people will be not only inspiring to adults that struggled with these issues but particularly parents, because the lag time between symptom presentation and diagnosis for kids is like two to five years. And in a childhood that’s a long time, that’s a long time to be symptomatic and fall off your developmental track. And that is time that in some ways can’t really be recouped completely. I think that if we as a nation could bring in such the same place as you just pointed out, that we bring pancreases, hearts, livers and other organs that we don’t have a problem talking about or going to the doctor for, that parents would recognize what is happening with their child and bring them for the treatment that they need and send them back in the developmental path. More importantly, if clinicians like myself, when they see people, when they see children or adults, would not only say, “let’s look at these symptoms and how we are going to treat them” but also say “did you know that with these particular symptoms you likely have these particular aptitudes, and let’s explore how you may be using them, how you could use them further, what direction that might propel you in and to spend time on that as well, because that’s so important for a child or adult’s development and self-esteem. HR: Very well said, and our society is not geared up to give all these individuals exposure so that they can find something that they are passionate about and good at, and not everybody is the same. We get taught one size fits all. And going back to the stigma, we graduated three aspie interns last year and they are all doing well in college and so on any so forth. However, not one of them would ask for the accommodations that would have made their lives so much easier because neither they know their parents, wanted the stigma involved. GS: Oh yes, that’s a huge problem I mean. I am very invested in public education but as you are pointing out, it’s very… If I say that I am doing a lecture on mental hot topic, the only people that will come will be people who are already either struggling with that issue and know it and stigma is not an issue and if it is, they are not coming because they don’t want to be in the audience, they don’t want to be seen being in the audience. So I have heard many people come up with lectures and say, “I wasn’t even thinking about this one when I came to this talk because my actually my son as ADD and I feel so relieved to hear this talk about Einstein,” or, you know, “my sister has depression and starting this talk about Abraham Lincoln just gave me a feeling of—oh, I see these strengths in her too and that made me feel better.” So, it is hard to get to people when they already have these. And as you are saying, in the generation before, it was even more prevalent, so, it’s true that just as you are saying I often see people coming in late and saying, I think I might be struggling with something, actually, I think I have always struggled with something but I had no idea what’s that thing or what the thing was, until just now my child has been diagnosed with this thing. And of course many of these issues do have genetic components and so it dawns on them that the same struggle their child has been having in school is the same struggle they had and that maybe they could benefit from some help now. That’s a very common scenario and it is so because of course, years ago people didn’t even know about these issues, they certainly weren’t talked about in children and the stigma was even greater. HR: Now you just did a great segway for me because you spoke about genetics and everybody wants to have a one cause. In other words, let’s take the autism community. Trying get the vaccine people to talk to the genetics people, to talk to the environmental people, and I did find myself like Rodney King, going “why can’t we just all get along?” Now look, couldn’t it be possible that somebody with a certain set of genes who gets a vaccine at a certain time, and eats a certain diet because the gut has more neurons than the brain and is in a certain kind of an environment–isn’t it possible to multifactorial? And it turns into a dogfight instead of saying, let’s all work together to do the best we can. GS: When there is fear, emotions run high and so, you have a lot of people very upset and fearful that this could happen to them or did happen to them as it were, so that is generating a lot of emotion. The other thing that drives a lot of emotion is money and there is only so much money to go around to fund research and unfortunately, I think that’s about to get a lot tighter because of the current administration’s feelings about medical research or science in general and funding it. But as long as there are so many dollars available for research, it could be limited. So, these groups sort of are really arguing over who is gonna get the money to do the work. Now, to be honest from my standpoint in terms of autism for example, a lot of work has been done, a lot of research has been done looking into vaccines. And quite uniformly, with the exception of the person who turned out to be a fraud and making up data. So, all data says that there just is no there-there in the vaccine ideology. I think if we are going to make progress, at a certain point you have to get a group to be willing to stop asking for more dollars because, as they said there is always somebody to go around, so, I feel that we need to keep doing research because you are right, we don’t know the cause, probably it is multifactorial, we just don’t know what all the factors are. That clearly is a genetic component but that’s not telling us enough and so I am concerned about the people who maintain their stance because, really, just because of the dollars and the fact that we need to do the science. HR: Yes. When I was chairman of the boys and girls club of Broward County, I would love to partner with another not for profit and apply for a grant together. Because it makes so much more sense, you are killing two birds with one stone, you are getting different perspectives. “So, you are with the urban league, I am with the boys and girls squad, we have this population of the Hackie Reitman Boys and Girls Club in the worst zip code in the world, you know, let’s get together and do it. “But as you point out, follow the money and people are watching their turf. Well, you and I, we will go and meet with the President and Congress sometime and we’ll straighten it out. Let’s say I am a parent of a child who has a different brain, okay, and is showing great promise in one specific area and I know my opinions on this; but what do you advise that parent? GS: At home, I would advise that parent to seek treatment for the issue that your child is struggling with. Because you do want to alleviate suffering and you do want them to learn early on, as you noted, the brain is most plastic to develop work around, tools and skills, they are going to manage those symptoms to alleviate or to work around the symptoms, and which will provide some rewiring that actually will be lasting, let’s say. I think that’s important. But, what I talked about in the book is that, in mine should be sort of the 80/20 principle which is, yeah you wanna spend about twenty percent of your time helping your child with their relative weakness, but you want to spend about eighty percent of your time helping your child hone and develop and explore their strength, and that’s not what most people are doing, most people are spending like ninety-five percent of their time on the weakness. And so, there is no room left for developing the thing that they really naturally are better at and when you are good at something and it’s pleasurable for you, then your brain releases the neuro-transmitter, dopamine. Dopamine is the neuro-transmitter of pleasure and reward, and so it creates a feedback loop. Your brain likes that, it feels good and wants to do more of it. So, it is much easier to get exceptionally good at something you are already good at, and like. Then the struggle to pull you up from something that really is not your fault. So, I go with this 80/20 principle. And in doing that; what are you gonna do? You are gonna expose them to many things that touch on this area of strength for them to see what it takes and what’s enjoyable. You are gonna carve out time for them to do that and you are gonna talk with their educator about ways that they can use their particular strengths to do whatever school work might be possible for them to use that for. So, if they are a super visual learner but auditory not so much; what projects can they do? What learning styles in school can the teacher employ to allow your child to manifest their strength. If they are doing a project and your kid is, their visual-spatial relations are fantastic because maybe they are on the spectrum a little better or maybe they have dyslexia and while the reading is really difficult for them, they are seeing patterns and the visual, spatial abodes are excellent, you want to talk to the teacher about any ways that projects can be presented and allowing them to do them using those skills, because that’s what they are going to be able to take and embed what they are trying to learn in a more favorable way and they are really going to be able show what they know and feel good about being able to do that. So, because schools unfortunately don’t take this approach at all today and they tend to have a much more, you know, “jump through every hoop, do it the same way approach,” it’s really up to parents to talk individually with their educator and try to present the data. If a parent is unsure of where their child’s strengths might lay, get their neuropsych tested. It would lead the way, it will guide you toward what are their relative strengths and what are their relative weaknesses so you can play to that. HR: You are scaring me because I agree with you so much. GS: I am sure we can find something to argue about if that’s what you would like. HR: Probably. How do people find out more about you? GS: So, if people want to find out more they can go to my website www.drgailsaltz.com. They can tweet me if they have a question, I am @DrGailSaltz. The book is available at Amazon, Barnes & Noble, pretty much wherever books are found. And the podcast, which is also called “The Power of Different,” it is available on iTunes or you can go to it from my website. HR: Well Gail, it’s been a pleasure speaking with you again. Thank you so much for being a guest again on Different Brains.com and thank you so much for all that you’re doing, for all of us whose brains might be a little bit different. GS: Thank you for having me, and thank you for getting the word out. (3 min 49 sec) In this episode, a teen with Down syndrome fulfills his dreams of going to college, a new device can help those with Asperger’s detect moods, and Henry Winkler discusses his new book and growing up with dyslexia! These stories and more in this week’s edition. 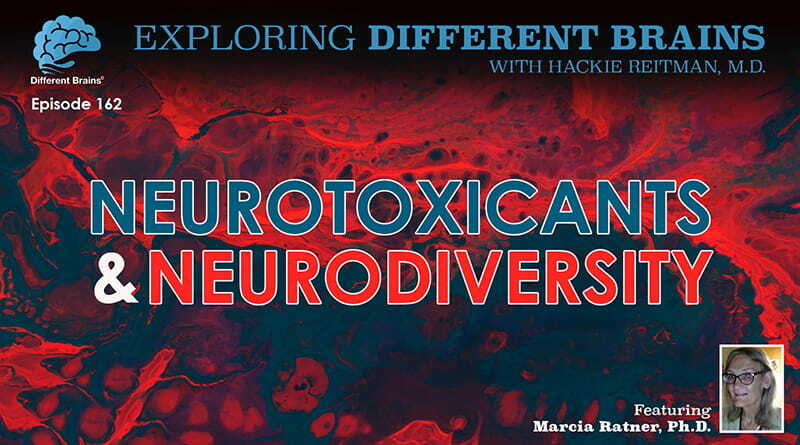 (24 minutes) In this episode, Dr. Hackie Reitman speaks with Dr. Marcia Ratner, world-leading neurotoxicologist and research scientist at the Boston University School of Medicine.